Below are some of the photos lifted from Clear Light brochures from the early 1980’s showing the complete line-up of Star3, Star2, SuperStar, Micro Diamond, and Micro Star systems, along with the various peripheral devices, including power control, remote controls, voting boxes, printers, and more. I designed and developed, and brought into manufacturing over 55 products at Clear Light over a period of 16 years, from 1971 to 1986, when I joined Apple. 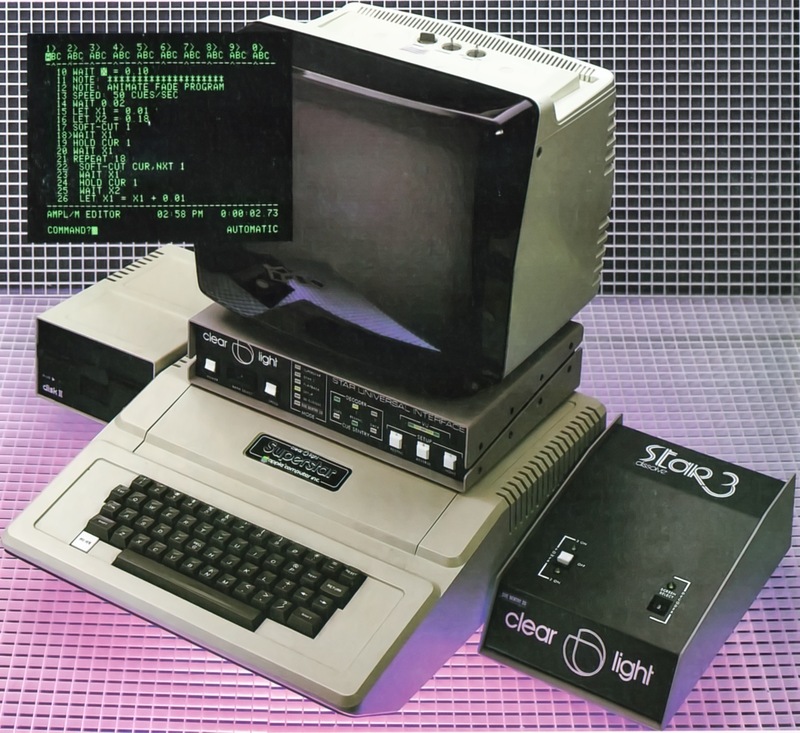 The Star3 System, originally introduced with gold paint in 1978, shown here in its new dark gray color, around 1981. The Star2 System shown in the insert. The Clear Light SuperStar in its original configuration, using an Apple // computer, two Apple floppy disk drives, a Universal Controller, and a 9" green monitor. As you can see, we had Clear Light private labels on both the computer and the disk drives, and sold it as a Clear Light SuperStar. This version was primarily used for demonstrations in 1891. The entire product line in 1981, except the SuperStar itself. The mini-projector carry-case system is shown at the top, along with the Micro Diamond and Micro Star systems, various peripherals, and the Star3 and Star2 system in the foreground. The Universal Interface connected a SuperStar, Star3 Dissolves, and an audio track together. The SuperStar was not required for playback. A later brochure showing the Superstar labeled Apple // with a Star3 Dissolve, a Universal Interface, and monitor. The insert is a screen shot showing programming language AMP/L. Capability was control of up to 30 projectors. The MicroStar System. This controlled up to 6 projectors. The center unit was the center dissolve as well as the memory programmer. This slimmer case design was introduced to enable all switches, controls, and LED’s to be mounted on the same printed circuit board. The Micro Star Memory Programmer. Five of these could be used for a 15 projector show, but its most common use was a stand-alone 2 or 3 projector programmer and playback unit. Eric working in his lab in the Florida Headquarters on a revision to the Micro Diamond Memory Programmer PC board. A sample program written in AMPL/M - Advanced Multi-Image Programming Language, Multi-Tasking Version, showing various functions, including the ability to start separate timelines of programming to run simultaneously and in parallel with the main program. It also included arithmetic statements, repeat loops, and many other unique functions related to programming of presentations, including voting, detection of events using external sensors for decision-making in real-time, and much more. The magic behind the Star System and Micro Series was the Mostek 3870 Single Chip Micro-Controller. It had enough program and working memory and I/O pins to handle all of the tasks we required. Admittedly, having 4 years of matching language programming experience on the IBM 7700 DAS at University of Rochester had a big impact on my ability to squeeze functionality and performance out of these chips that our competitors could not even imagine. The Diamond System was our first all-digital system, in our new cabinet design, painted silver. Also included in the Diamond System were dissolve units and a memory programmer. The stand-alone multi-tone encoder/decoder two-projector system - one of the many products in the 1200 System line. These cabinets were painted a beautiful egg-shell blue. The 1200 System was the first publicly available product line from Clear Light, and used paper tape programming for up to 12 dissolves, or 24 projectors (only 2 projectors per dissolve for the 1200 System). The system was mostly analog with some digital circuitry around the tape reader and editor.